Sunday 5 ANNOUNCER What do you mean, people don't need that kind of information. TRAPNELL I mean this by the people of Burlington, of Iowa, and of the United States, as a basis for the intellietn exercise of their voting franchise, is not the highly technical or scientific information which is secret, nor or restricted data as defined in the Atomic Energy Act of 1946. All of the information-- and much more--- that is required for a sound public appraisal of atomic energy is already public. Much of it was never any secret, but was subject to censorship during the war because the government didn't want any discussion at all of atomic energy. This information is readily available today-- or perhaps I should say it is available and the purpose of such things as Atomic Energy Week is to make it more readily available. 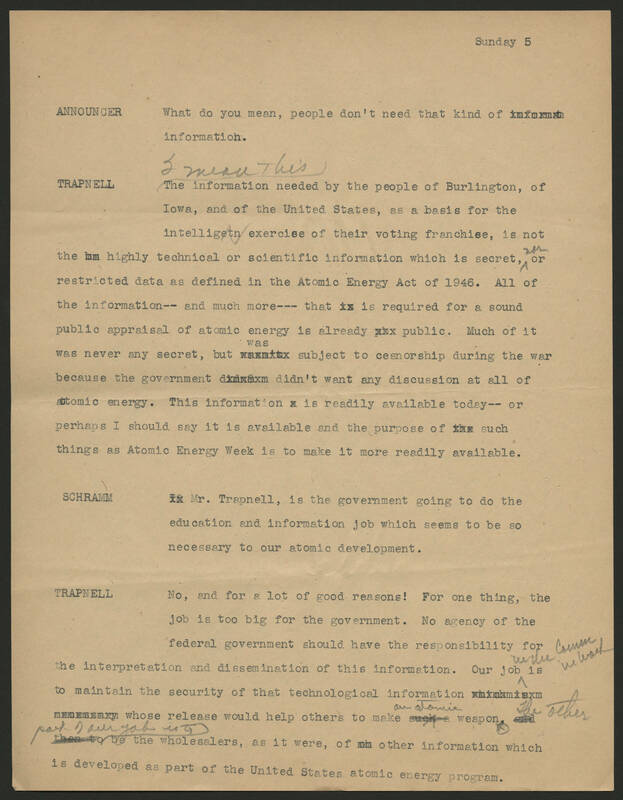 SCHRAMM Mr. Trapnell, is the government going to do the education and information job which seems to be so necessary to our atomic development. TRAPNELL No, and for a lot of good reasons! For one thing, the job is too big for the government. No agency of the federal government should have the responsibility for the interpretation and dissemination of this information. Our job in the Comm we work is to maintain the security of that technological information whose release would help others to make an atomic weapon. The other part of our job is the wholesalers, as it were, of other information which is developed as part of the United States atomic energy program.